Barcelona, Wednesday 19th of September 2012 – Top Management, international engineering firm that specialises in logistic parks, industrial facilities, retail parks and cold warehouses, was responsible of the construction management of the Michelin Spain and Portugal new logistic centre to whose inauguration they attended today. The final user, MICHELIN, as well as the developer SABA Logistic parcs in partnership with CILSA, entrusted the engineering firm TOP MANAGEMENT with the adaptation of the warehouses. More specifically, the firm developed, for SABA, a fit-out and update, with regard to the standards to be complied by the warehouses, mission together with the corresponding building permit up until its granting. 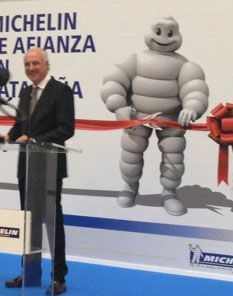 For MICHELIN, they carried out an interior offices’ fit-out and the writing out of the business activity permit project (environmental project and fire protection project) up until the granting of the opening and operating license. From this 25.000m2 new centre, the French multinational will supply more than 600 points of sale in Catalonia, the Balearic Islands and Andorra. They will also make nearly 5.000 trips on an annual basis along different routes and more that 1.700 lorries from various European factories will unload there. José Rebollo, president of Michelin Spain and Portugal, Antonio Marín, the centre’s manager, Jordi Carbonell, sub-director of the Generalitat’s Industrial Policy and Josep Oriol general manager of Saba Parques Logísticos assisted the inauguration. Lauris Deslex, general manager of Top Management also attended the opening on behalf of the engineering firm. The move from the Santa Perpetua de la Mogoda’s facility was mainly due to safety reasons, a highly relevant point if one takes into account the product that is stored in their warehouses. After the warehouses’ adaptation, carried out by the construction engineering firm Top Management, the Subirats’ centre now has approximately 3.000 sprinklers and a tank of nearly 750.000 litres of water. During the opening ceremony Cincia Poncino, logistic manager for Michelin in the south of Europe, expressed their appreciation of the work realized by the engineering firm TOP MANAGEMENT.